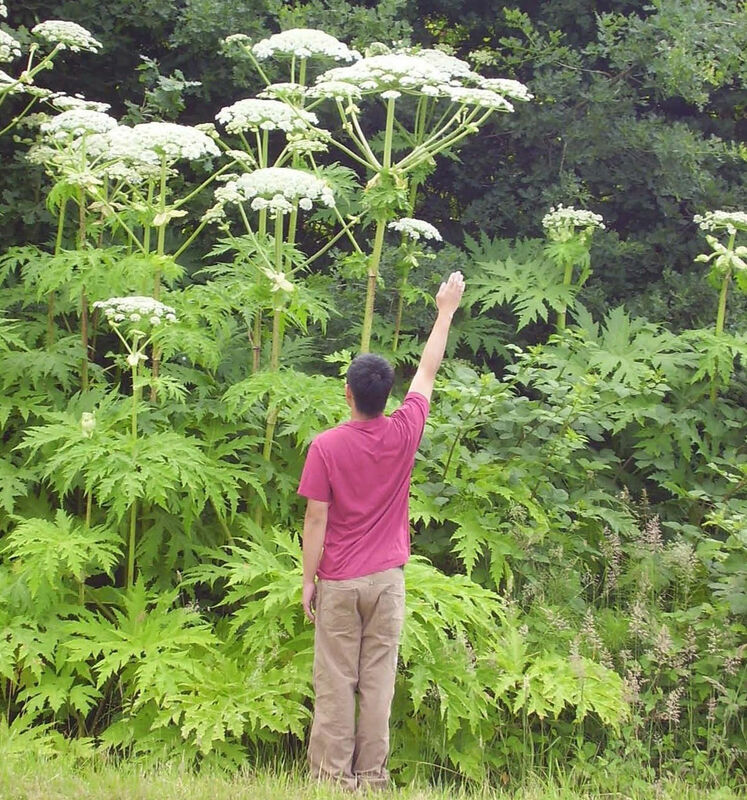 Giant hogweed (Heracleum mantegazzianum) may be described as 'majestic', 'spectacular', and 'brobdingnagian'. (Okay, maybe not that last one - I just needed a more spectacular word than 'gigantic'). Indeed, giant hogweed is all of these things, and it is easy to understand why it is admired and cultivated. Many people heard about this plant for the first time in the summer of 2010 when the media caught wind of the fact that giant hogweed contains a toxic sap that is dangerous to people. This sap contains chemicals that can cause severe welts, rashes, and blistering followed by pigmented scarring when it contacts skin in the presence of sunlight (a process called phytophotodermatitis). Scarring can persist for as long as six years. This sap is found in the leaves, stems, flowers, and roots of giant hogweed as well as in other plants in the Carrot Family, though not nearly to the same degree. Contact with sap can occur by brushing against any broken plant parts, handling plant material, or touching tools or mowing equipment used during giant hogweed removal. Giant hogweed is an invasive alien plant that originates from the Caucasus Mountains in west central Asia where it grows in subalpine meadows and forest edges. It arrived in our fair region through horticulture due to its impressive size and appeal as a specimen plant in gardens. It can grow 2-5 meters tall, has large, deeply incised and pointed compound leaves up to 3 metres wide, and large, flat-topped, umbrella-shaped white flower clusters up to 1 meter in diameter. Another identifying feature is the hollow stem with dark reddish-purple raised spots and stiff hairs (though don't get close enough to this plant to verify the hollow stem). In the Fraser Valley giant hogweed grows in full or partial shade along streams, moist forests, and meadows. Blooming occurs from mid-May through early August. Two native plants are sometimes confused with giant hogweed: cow parsnip (Heracleum maximum) and palmate coltsfood (Petasites frigidus). 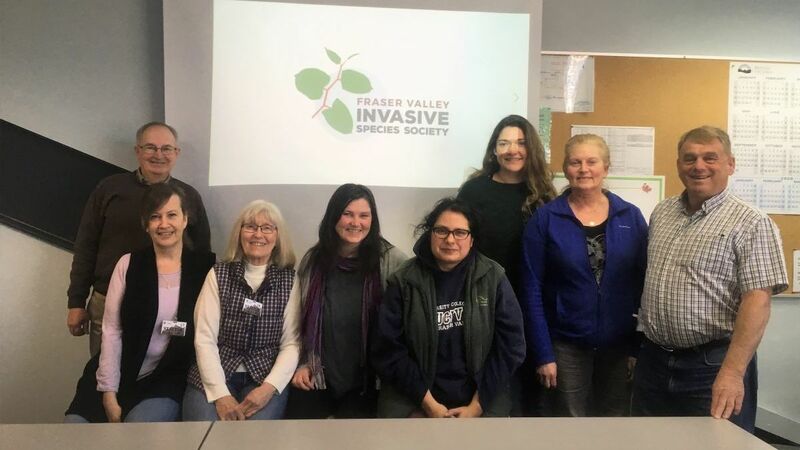 Giant hogweed is not only a threat to human health and safety, but also to agricultural land and natural areas as it easily crowds out vegetation, reducing crop and wildlife habitat value. It is a highly competitive plant due to vigorous early-season growth, tolerance of full shade and seasonal flooding, and ability to co-exist with other widespread and aggressive invasive plant species. Relatively shallow roots do not hold the soil as well as a healthy complex of native species, and as a consequence infestations can result in increased erosion on steep terrain or along stream banks, particularly when winter dieback exposes soil to water erosion during our rainy season. Controlling giant hogweed, like controlling any invasive plant you don't want growing in your garden, is accomplished by understanding its growth cycle and then exploiting its weaknesses. Giant hogweed disperses and establishes by seed, which are moved by wind up to 4 meters, or longer distances by water along streams, ditches, or storm pipes. It grows for 3-5 years before flowering and dying in the last year. During the first years of growth it stores increasing amounts of energy in its roots to subsequently develop its flower stalk, flowers, and seeds. (You may observe in an established population plants of varying ages – small first year plants, larger older plants, and fourth or fifth year plants in flower. Repeatedly cutting the flower stalk at ground level can be a method of killing giant hogweed. Removing the seed head in the summer can prevent the production and dispersal of new seeds – a useful short-term control technique. Of course, the last and perhaps most important step is monitoring the area to prevent reestablishment from seeds in the soil. If you have this plant on your property and are planning on controlling it yourself, make sure your eyes and skin are properly protected, cut off the seed head for a stopgap measure, or cut the plant off at the base below the soil surface with a shovel. Any remnant plant parts should be bagged and thrown in the garbage, not composted. For more information on giant hogweed click the link under Species.